The above info came from Natalie Choo, and was edited by yours truly (contact me). The image came from Amazon.com. 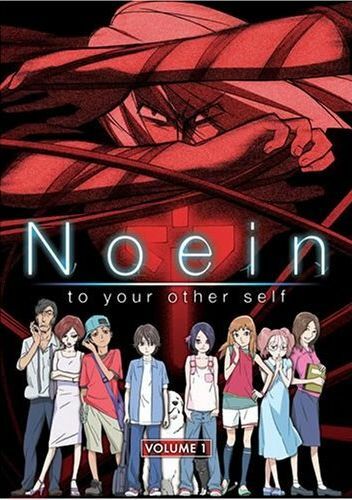 Noein, also known as Noein- To Your Other Self ( Noein- Mou Hitori no Kimi e ) is a 13 volume manga and 24 episode anime that revolves around the amazing discovery of a group of seventh graders on one fateful night. Haruka, Yuu, and their other friends go out ghost hunting at a cemetery near town. Yuu is forced to go to cram school after his mother picks him up from the cemetery when she finds out he didn't go. Then, the group left off where their investigation took place. Haruka spots blue snow, but Ai remarks that it's impossible since it's summer. The rest of the group except Haruka go further up the cemetery and by an amazing shock they've found a ghost! The group comes running back and Ai grabs Haruka's hand to make sure she catches up on the running. Haruka realizes the ghost is after her, she is known as the "Dragon's Torque", posseses it, and that's what the "ghost" wants. Actually, it's a human from the future. Haruka follows another path to lead them away from her friends. Yuu comes back to save Haruka, as he knows something's gone wrong. In an attempt to save Haruka, he finds out that the "ghost" is actually him in 15 years (his name is Karasu). And there is another Yuu known as "Karasu" from another timespace. He, on the other hand, is most likely to be on the bad side. Both Yuu and Karasu agree that Noein is nothing like them. Haruka and Yuu have been led on an adventure to further learn about the different time spaces and the future. La'cryma is one of the timespaces that protects humanity, and Shangri'la wants to destroy them. The key to stopping Shangri'la is the Dragon's Torque, aka Haruka Kaminogi. The above description came from Natalie Choo and Meep, and was edited by yours truly (contact me).